When I embarked on my Chicago Pie Tour back in March, one pie slinger I sadly missed is the suggestively named Cheap Tart Bakery. Owned and operated by pastry chef Dinah Grossman, Cheap Tart offers up sweet and savory pies, galettes and tarts, hand pies and pie pops, all made-to-order with seasonal, local ingredients and available for delivery within Chicago's city limits. For all you Windy City dwellers, that means you could have fresh Ginger Cream Pie, Apple Tarte Tatin, or Maple Pecan Pie Pops (and much more) appear on your doorstep in 48 hours. Though I didn't get to make an order when I was there, Dinah has written up a lovely little post about her love of rhubarb which developed while she was growing up in rural Maine. Then, she shares her recipe for a beautiful Rhubarb Tart. "Before starting my pie business, I didn’t give much thought to why pie was the thing I always chose to bake. I liked to eat it, of course, and I enjoyed the tactile elements--rolling out the crust, with its pale flecks of butter showing through, slicing ripe peaches, squeezing the pits from juicy tart cherries. But perhaps more that those things I found it comforting to have a pie nearby. It wasn’t so much that pie reminded me of someone in particular (I do not come from a long line of pie makers), but through its ingredients, a pie connected me to a sense of place. I just felt better with on around. I grew up in rural Maine, surrounded by acres of woods, fields, and orchards. In our family we mapped much of that land by referring to perennial edible landmarks--the blackberry patch, a particular apple tree, or the place where the rhubarb reappeared every spring. I would keep a watchful eye on these particular locations, making sure I knew when the blackberries or apples were almost ready so I never missed them at their peak. Often, impatient for the fruit to ripen, I would sample a berry or apple too soon, the intensely sour bite of the juice becoming, over the years, as welcome a taste as the mellow sweetness that followed a couple of weeks later. To this day I prefer fruits with a pronounced acidity, which explains my affinity for that tartest of pie ingredients: rhubarb. Of all the edibles whose progress I monitored, rhubarb could be counted on to appear first and was ready to be harvested long before anything else. It was also plentiful, the long stalks and elephantine leaves growing at a pace even our steady pie baking couldn’t match. During rhubarb season a pie was almost always on the kitchen table. And not just at our house. For many of our neighbors, too, a rhubarb pie became as ubiquitous as the salt and pepper shakers on the counter. When only a slice remained in the Pyrex plate, someone inevitably walked outside and pulled another armful of stalks from the ground to be baked into a replacement. Aside from pie, I enjoyed rhubarb best pulled straight from the ground, the end dipped in a small bowl of dark brown sugar. As kids, my ordinarily health-conscious mother would let us take our treat outside, where a stalk of rhubarb dipped then chewed and sucked on, became an activity as well as a snack. My favorite spot to sit and chew was inside a horseshoe of lilac bushes growing around an enormous rock in our yard. Surrounded by the heady smell of those pale purple flowers, the sweet and sour rhubarb would take on another taste altogether. Like all favorite foods my love for rhubarb is inextricably connected to these memories. It is impossible to make a rhubarb pie without also remembering the cold, day-old slices eaten in my neighbor’s kitchen, how somehow the sweet-tart filling and crisp edges of crust tasted better a day after the pie was made. I can’t rinse a haul of farmers market rhubarb without also remembering the feeling of walking barefoot through the tall, wet lawn by our barn to pull up the shiny stalks, the squeak and snap as each came away from the plant. It’s been more than ten years since I lived near that patch, but as I bake my way through a third year of business I’m reminded of why I chose this pastry among all others to guide me. In a third floor Chicago apartment with no balcony or back yard maybe I can’t grow my own fruit, but I can mark the seasons by making pies from rhubarb, then strawberries, then peaches. If I can’t ground myself through the ground, I’ll do it with pie." Post and photos by Dinah Grossman of Chicago's Cheap Tart Bakery. Find Cheap Tart online and on Twitter, Facebook, and Instagram. 1. In a bowl of a food processor combine the flour, salt, sugar, and butter. Pulse until the butter is broken down to the size of small peas. 2. Add the cider vinegar to the ice water and stir. Add 3 Tblsp. of the water/cider mixture to the food processor and pulse to moisten the flour mixture. If the mixture still looks dry and powdery, add more water a teaspoon at a time. The dough should just hold together when you squeeze a small amount in your hand, but it should not be sticky and should not form a ball in the food processor. When the mixture looks crumbly and slightly darker in color, it's done. 3. Dump the crumbs into a big mixing bowl and pack them into a rough ball. Wrap the ball in plastic wrap and use the plastic to help you flatten the dough into a disk. Refrigerate at least 1 hour, preferably overnight. 1. Combine all ingredients in a bowl except 1 Tblsp. of the sugar an flour. 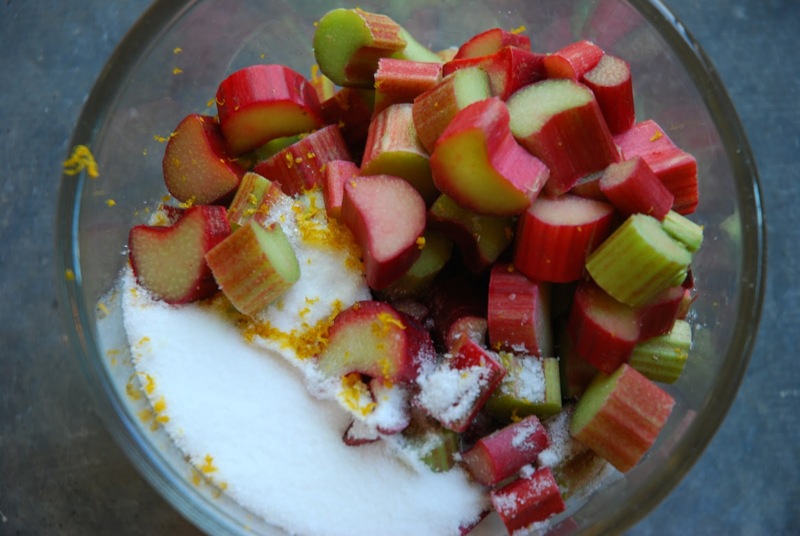 When the rhubarb pieces are coated in the tapioca/sugar mixture, set aside. 2. Toll the pie crust into a circle about 1/8'' thick. The crust should hang over the edges of the pie pan by about an inch and a half all the way around. Place the crust in the pie pan, and sprinkle the Tblsp. of flour and 2 tsp. of sugar on the bottom. 3. Preheat oven to 400 degrees F. Add the rhubarb mixture to the crust, mounding the filling slightly in the center. Starting with the edge of the crust farthest from you, fold the edge over the filling, then rotate the pan slightly and fold the crust over again, repeating all the way around. The crust will overlap at each fold. Brush the crust with the milk or cream, and sprinkle the remaining teaspoon of sugar over the top. 4. Bake at 400 for 25 minutes with the oven rack on the bottom rung. Reduce oven temperature to 375 and bake an additional 20-25 minutes (moving the tart to the middle rack of the oven), or until the crust is a deep golden brown and the juices are bubbling. Cool completely before slicing. The photos are (if possible) even yummier than the pie! The rhubarb here is now 4" tall!